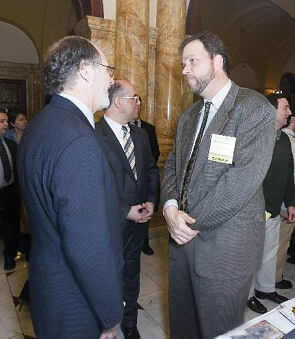 NJBIA Manufacturers - Made In New Jersey - April 2007 | Salon Interiors Inc.
NJBIA manufacturers lined the halls of the State House on March 15, showing Governor Jon Corzine, former Governor Richard Codey and dozens of legislators what they make, how they make it, and what New Jersey should do to help manufacturing succeed. It was all part of NJBlA's Made in New Jersey Day, designed to highlight the products and innovations of New Jersey manufacturers, said NJBIA President Philip Kirschner. "Our manufacturers are amazing," Kirschner said. "Year in and year out they stand up to fierce global competition while operating in one of the highest cost states in the nation. They provide quality jobs and good benefits. Manufacturing in New Jersey has a great story to tell and Made in New Jersey Day is our chance to tell it." The exhibits ran the gamut from handmade porcelain figurines and building materials made entirely out of recycled paper to traditional Italian ice cream, safety restraints used in NASCAR race cars, and upscale leather briefcases. Corzine toured the exhibits, stopping Exhibit in at each display and talking with the exhibitors about their products and their businesses. Codey, who is the Senate President, also stopped at many exhibit, as did numerous members of the State Senate and Assembly. Seventeen manufacturers contributed products to a New Jersey Product Sample bag, which was distributed to show off many other New Jersey-made products. Speaking to the press following the tour, Corzine said New Jersey manufacturers face serious competition from across the world, but expressed optimism that the lower business taxes, innovative ideas, and improvements in productivity his administration has championed will help keep manufacturing viable in the State. The event is part of NJBIA's award- winning Manufacturing Counts! Campaign for Manufacturing Renewal in New jersey. To learn more about what NJBIA does for manufacturing, visit the site at www.njbia. org/. Trane, a division of American Standard, of Hamilton Twp.